READING, Pa. – The 34th Annual Dodge NHRA Nationals rolls into Maple Grove Raceway this week with racers from all over the northeast looking for national event glory. With Hurricane Florence taking aim at the East Coast, the car count at Reading will be extremely light as the weather made travel difficult for some racers. Even with a Hurricane in play, the weather forecast at Maple Grove looks pretty good with only a 20% chance of rain throughout the weekend. Racers in Super Stock, Stock Eliminator, Super Comp, and Super Gas took to the track on Thursday for qualifying, time trials, and Stock class eliminations. Friday will be a short day for the sportsman crowd as the only action on the schedule will be a fourth time trial for the Super classes along with first round of final eliminations for all four classes. Saturday will be busy as three rounds of sportsman eliminations are scheduled for Saturday morning. Saturday’s rounds will reduce the fields down to the final four competitors in each class for the Big Show on Sunday. Sunday’s action will include the semifinals and finals in each class. Although the car counts are fairly light this week, the fields are stacked with top-caliber competitions. Car counts for each class are as follows: Super Stock – 43, Stock Eliminator – 41, Super Comp – 46, Super Gas – 38. After picking five competitors in each class at INDY (you can read that article here), the ole DragChamp pulled a rabbit out of his hat by accurately picking Devin Isenhower to win Super Gas, which he did. Depending on how you look at it, I was either 1 for 4 (I picked 1 winner out of four classes) or 1 for 20 (I did select a total of 20 competitors across 4 classes). I like to think I was 1 for 4, you can decide for yourself. Due to the smaller fields this week, I’ll stick with just three picks for each class. Super Stock is a loaded field so it will be difficult to narrow it down to just three picks but here’s my picks. Dan Fletcher – When the winningest sportsman driver (I count Frank Manzo as a Pro driver) is in the field, you have to pick him. He’s close to home this week and has to be on top of the list. Anthony Bertozzi – After a runner-up finish last year, Bertozzi will be hungry to finish the deal this year in addition to the fact that he needs to improve his points total if he’s going to have a shot at another national championship. Pete D’Agnolo – This guy wins everywhere so it’s an easy choice to include him in the Top 3. With last year’s champion missing from the field this year, we’ll have a new champion. The Stock field includes a number of top-tier racers but here are my picks. Anthony Fetch – Talented driver with a good car under him. Fetch knows how to turn on win lights. Allison Smyth – The Port-A-Tree driver runner-upped at New England last week, would be nice to seal the deal this week. Joe Santangelo – This guy is badass, he can win in anything, anywhere. He’s definitely due for a big win. Devin Isenhower – I doubled-down on this guy at INDY and he pulled it out, he’s been laying down sick laps in the dragster and could easily wreck the field again this week. Tom Stalba – Always a tough out, he’s overdue for a national event win. Mike Robilotto – The defending Division 1 champ has killed it this year, another win would cap off a tremendous year. Iggie Boicesco – After a perfect 9.900 in the final at New England last week, Iggie put himself in the championship hunt. Ray Sawyer – Typically I might pick Ray’s son Mike but Dad has been on kill this year. I like his chances this week. Charlie Kenopic – The Virginia Nationals champ went to the semi’s at INDY on the strength of several killer laps. Visit us on Facebook and share your picks. 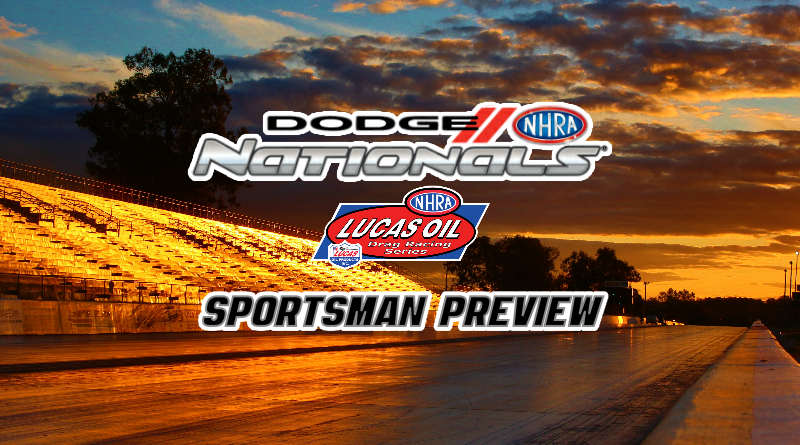 Check back throughout the weekend as we’ll post sportsman class updates from the Dodge NHRA Nationals. Visit DragChamp daily for NHRA sportsman racing news, results, and updates. DragChamp.com is your online source for Lucas Oil Drag Racing Series results.